What’s Wrong With The CDC’s Final Report On Formaldehyde In The FEMA Trailers? In the wake of Hurricane Katrina (and later Hurricane Rita), the Feds were faced with the daunting task of providing housing for more than 100,000 people on an emergency basis. In response, industry worked 24/7 to supply various types of trailers. I’ve been told that one manufacturer tripled production! It’s not hard to believe that recommended aeration times for such formaldehyde-containing products as plywood, particle board, and carpet could have been cut short to meet the incredible demand. I doubt that FEMA officials wanted to tell the public to please wait for their trailers, while the formaldehyde dissipates out of them—anymore than the people would have been willing to wait. Bear this in mind as our discussion continues. In December 2007 and January 2008, the CDC measured formaldehyde levels in a stratified (strata based on type of trailer) random sample of 519 FEMA-supplied trailers. 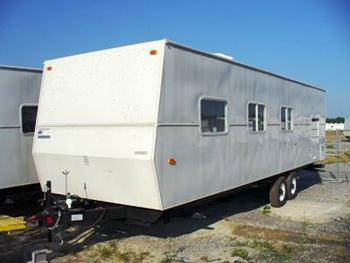 The geometric mean level of formaldehyde in sampled trailers was 77 parts-per-billion (ppb). The range encountered was 3-590 ppb. To gain some appreciation of how small a part-per-billion is, consider that one part-per-MILLION is represented by a credit card placed on a football field. A part-per-billion is one letter in the smallest type on that credit card, placed on a football field. The good news is that this mean level is lower than 100 ppb, generally considered to be the point at which sensitive individuals report symptoms. By comparison, nearly all people experience some irritation at 800 ppb, and 750 ppb is the OSHA 8-hour time-weighted average allowable exposure level for formaldehyde. The agency utilized NIOSH Method 2016, a form of wet chemical analysis that required sample to be taken via a special pump for one hour at one select location in the trailer. We do not believe that this was the best way to accomplish the formaldehyde measurements. For one thing, the method has poor accuracy: ±19%. For another, the result is simply an integrated average “single number,” that could be affected by ventilation and the presence of ozone. A direct-reading instrument would have been a much better choice, and would have allowed sampling all over the trailer. Sampling at only a single spot in the trailer might not be truly representative, and does not allow testing of potential point sources of formaldehyde, such as cabinetry. Further, it is unclear if appropriate temperature corrections were made, given that the trailers tested ranged from 41° F – 91° F. Lack of temperature compensation could have affected the results by another 9%. Regrettably, some officials who should know better seem to prefer wet chemical over instrumentation methods, although in many cases, the instrumentation methods are far superior. Surprisingly, no correction was made for cigarette smoke in the air, even though it is known that this smoke contains formaldehyde. It would have been quite simple to also monitor the air for a marker for cigarette smoke, and exclude these trailers from the final results. Instead, the CDC merely relied on survey answers from the occupants regarding their smoking habits, but did nothing to adjust the air monitoring data for this potentially confounding effect. Despite the disclaimer that “it was not a health study,” one wonders why not a single health question appeared on the Interviewer Questionnaire. It would surely have been valuable to correlate measured concentrations with reported symptoms, even in the most generic manner. After all, this entire study was driven by media horror stories of supposedly drastic health effects. More than that, it is standard practice in any monitoring study, especially one clearly devoted to obtaining data in response to complaints from people in an occupancy, to catalog those complaints. A health study could be done later, and would build on this data. The absence of any symptom questions is a serious omission. As such, the CDC final report will probably do little to silence the plaintiff’s attorneys and Green activists.